A week ago it was raining here almost everyday and each day felt as though it was Winter already with gloomy clouds hanging low and no sun anywhere in sight. Rainy evenings had us craving for spicy warm food, to perk us up. 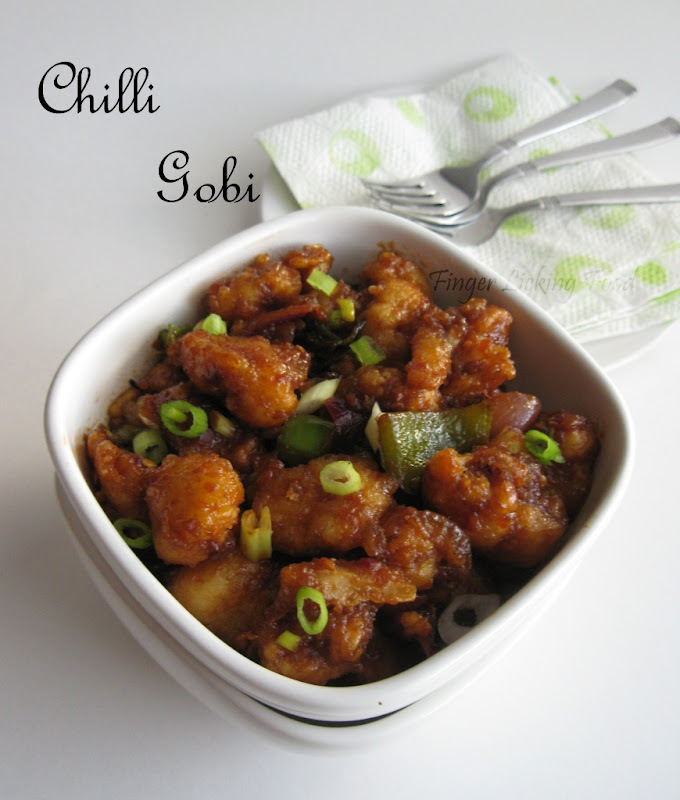 Chilli Gobi is very similar to Gobi Manchuri but with spice levels at a new high. If you like spicy food then this will make your taste buds sing, or scream if you can't take the heat! Bring a small pot of water to boil and add 1 tsp salt. Add cauliflower and par boil, for around 4-5 minutes. Drain and keep aside. Heat oil in a deep pan for frying. Make a thick batter of the corn flour with water. It should be thick enough to coat the floret evenly, otherwise the coating will fall apart when tossing with the sauces. Dip each floret in this batter and drop in hot oil. Fry till light brown. Make sure oil is not too hot(not smoking), this will lead to fast and uneven browning. Drain excess oil from fried florets on paper towels. In a small bowl, mix the dark soy sauce, chilli sauce and ketchup .Heat 2 tbsp oil in a pan. Add green chillies and fry for a minute. Then add onions and sauté till half done. Add the bell pepper and sauté till both onions and bell pepper are cooked through. Add the fried florets and salt. Pour the prepared sauce mixture over the florets and veggies and toss to coat completely. Toss well to combine. Taste and season accordingly. Garnish with chopped scallions. Hey......namratha I always like ur presentation and pics....to be frank I got inspired by ur blog too....I,m doing some changes for the posts....pls, if u find time do drop by and leave ur suggestions. that looks awesome! the consistency of the dish is just right! I didn't know we had to par boil them. I will sure do that next time when i make them. Looks so so delicous. Yummy! I love spicy food. Wow, that looks rather "meaty", in a good way of course. I can't take too much heat. I wish I could because this dish looks delicious! Love gobi manchurian...yours looks so yummy! wow this dish looks delicious and yummy.You can visit my blog and view my recipes and give ur comments. yummy chilli gobi looks gorgeous.. This is such an amazing recipe..!! I can't tell how popular this is getting in my friends!.. Thanks a lot mam!! Can be also used as a filling for the Pita bread, I think!! !